Replace your groin armour now Stormtrooper #66! 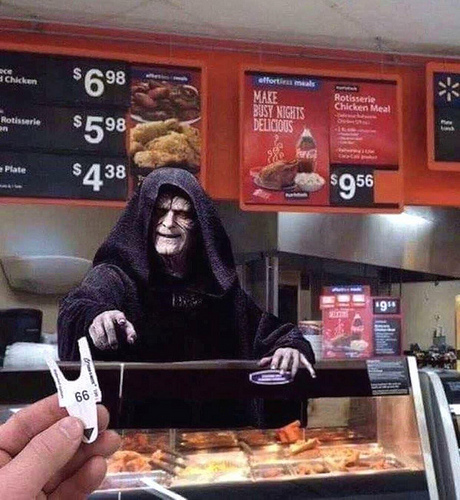 "Beware, the sauce is strong with this one"
Sorry we a only taking imperial orders. "Yeah, we're having a romantic night in and maybe a little wookie later"
"Now young Skywalker, you will dine!" "Screw the diet. I'm having a carbo-night." "Don't order the Chicken Surprise, or you'll be Sithing your guts out all night long." "I'm sorry the valet damaged the car's exhaust pipe, sir. We Siths aren't known for our tendency for empathy, but in this case I understand and share your distress." "You can't ticket with you." Try the Palpoutine cheese-curd/gravy fries... and tip your server. That's nothing. You should see the man who has 69. "Just the salad? That's a grim order." "I don't really like him,I was just being sithophantic." Theresa May pops out without makeup. Thank you sir, we'll bring it over when it's ready, where are you sitting? Over there on the Dark Side of the restaurant. Welcome to the pork side. Something, something, something, . . . with cheese. "Oh, believe me. I can teach you a new meaning of 'overcharged' with a snap of my fingers." "Hey, have you done Order 66 yet?" "It will be executed as soon as I can DEW IT!" "Welcome! Take your time to make your pick! We have absolutely the best chicken in town!" "Only a Sith deals in absolu... Oh. Right." "That joke was too Forced." "How dare you call me a sissy sith!" "I need to fulfill my quota and you are just the ticket." "I was actually hoping for a 99, but I'm not going to make a fuss"
"And 66 takes a run up...it's a GHOOOOUL!" "I'm too young to expect you yet!" "I'm not sure, I think he came from a Subway"